Arbuscular Mycorrhizal Fungi (AMF) have over the years played critical roles in nutrient cycling and are therefore the main pathway through which most plants obtain mineral nutrients and as such, are very crucial in terrestrial ecosystem functioning as reported by new studies. Arbuscular Mycorrhizal Fungi (AMF) have over the years played critical roles in nutrient cycling and are therefore the main pathway through which most plants obtain mineral nutrients and as such, are very crucial in terrestrial ecosystem functioning as reported by new studies. These are structures resulting from the symbiosis between these fungi and plant roots, occurring in most soils and colonize roots of many plant species and directly involved in plant mineral nutrition. In this mutualistic symbiosis, plants exchange photosynthates, not only for mineral nutrients, but also for increased resistance to diseases, drought and extreme temperatures. Lead author Philip W. Dugbley, who conducted the research for his master's degree in tropical silviculture analyzed data on the growth and survival parameters of the Africa red mahogany such as the height, diameter, leaf count and percentage survival as affected by AMF pre-inoculation on ex-coal mined site conducted in the South Sumatra of Indonesia. Dugbley said "Mycorrhizal fungi are removed entirely in newly graded lands and always requires inoculation if the objective is a functional terrestrial ecosystem. Eroded land is also in nearly the same condition and the arbuscular mycorrhizal fungi (AMF) can therefore be integrated in soil management. The symbiotic root-fungal association increases the uptake of less mobile nutrients". Arbuscular mycorrhizae fungi played a major role in the survival of the species (Khaya anthoteca) on the field. Plants are also able to withstand harsh environmental conditions through fungi-plant symbiosis enhancing the chances of survival on the field and thus, aiding the plant establishment and thereby making AMF application feasible and sound technology for the establishment of K. anthoteca on ex-coal mined sites said Dugbley, who is currently a translator/editor at SEAMEO Biotrop, Bogor. According to Dugbley, "after transplanting vegetatively propagated K. anthoteca to the field, non-mycorrhizal (NM) treatment recorded the highest mortality of 56.25% with only 43.75% plants surviving while K. anthoteca propagules inoculated with Glomus manihotis had the highest percentage survival of 81.25%. 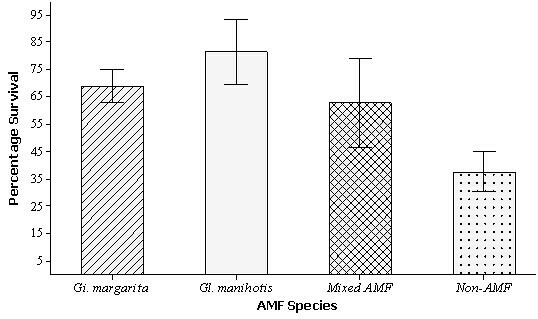 There were significant differences between NM plants and AMF inoculated plants as well as between the various AM treated plants on the percentage survival of K. anthoteca according to a t-test analysis for independent samples. With mycorrhizal colonization in the roots, there is increased absorption surface area, greater soil area exposed for longevity of absorbing roots, better utilization of low-available nutrients and better retention of soluble nutrients, thus reducing reaction with soil colloids or leaching losses. The arbuscular mycorrhizae fungi increase establishment, nodulation and atmospheric nitrogen fixation capacity. Additional co-others were Dr. Ir. Irdika Mansur of SEAMEO Biotrop; Bogor Agricultural University and Dr. Ir. Basuki Wasis of Bogor Agricultural University. The research was supported by scholarship from the Government of Indonesia with assistance from PT. Bukit Asam of South Sumatra, Indonesia. A paper about the study appeared recently in American Journal of Agriculture and Forestry.